Gold is forming a false bottom that could send shares of gold mining stocks lower. It's no secret that the revenues and profits of gold mining companies are directly correlated to the realized gold prices they receive. In turn, the performances of these stocks are heavily dependent on the price of gold. This can be seen in the chart below, which compares each of the three largest gold miners' stock prices to the price of gold. The mining companies in the chart above are Barrick Gold, Goldcorp, and Newmont Mining. Each of these companies performed stronger than the commodity itself when its value was rising. However, the volatility of these stocks also caused them to react worse when gold declined in value. The downtrend was recently halted as both the mining stocks and the commodity have begun to trade sideways. This has led some analysts to the conclusion that gold is bottoming, however I still foresee many headwinds for the price of gold that cause me to believe the recent price action may be a false bottom. The price of gold is influenced by many factors, including the actions of central banks, economic strength, and the commodity's demand relative to other investments. In each of these areas, there appears to be potential headwinds for the price of gold moving forward. In March of 2009, then chairman Ben Bernanke announced that the U.S. Government would buy $300 billion worth of long-term bonds in an attempt to stimulate the economy. Then, in early November of 2010, the fed announced an extension of their bond-buying program. This one was valued at $600 billion and spanned approximately a year and a half. The Fed would announce two more easings over the next three years, reaching $85 billion worth of asset purchases a month at the program's height. With each easing, the value of the dollar decreased, and consequently the price of gold increased, leading to higher realized gold prices for mining companies. At this current juncture, Chairwoman Janet Yellen has announced that the Federal Reserve is planning to end all asset purchases by October 2014, meaning the value of the dollar should stabilize, retracting possibly one of the most powerful tailwinds gold has seen in the last half century. Gold tends to trade higher when the economy is stressed and there is concern about stability. At the present moment, while Russian-Ukraine tensions show some signs of instability, the overall economic outlook within the U.S. is very strong. In fact, the U.S. CPI has increased in each of the last five months. An increased CPI number shows that the economy is strong and stable enough to allow price levels to rise. Some investors have used this inflation indicator to support the argument for higher gold prices. However, Janet Yellen has made it apparent in her previous testimonies with congress that inflation is of top concern to her and her colleagues. She has answered a barrage of questions regarding how the Fed plans to fight inflation while not derailing economic growth. While she has not yet given a timeframe as to when the fed will begin to implement a contractionatory monitory policy, Mrs. Yellen does appear ready and willing to take actions to combat rising price levels. The chairwoman seems committed to controlling inflation in the future, thus limiting its effect on gold prices. 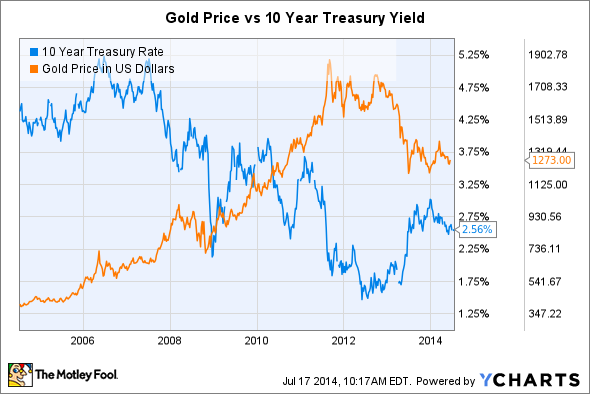 In the chart above, it can be seen that gold has traded inversely to the 10 year treasury rate over the past ten years. Not mentioned in The Fed section of this article is the fact that interest rates have been kept artificially low since the end of 2011, enabling gold prices to climb higher. Now, with the economy in its current expansionitory state, Dallas Fed President Richard Fisher recently declared that interest rates are likely to begin rising in the early part of 2015 . If Fisher is correct, and rates do indeed move higher in the near future, then the returns of bonds and other securities should increase and become more attractive to investors, possibly offering a safer hedge on the stock market than gold. 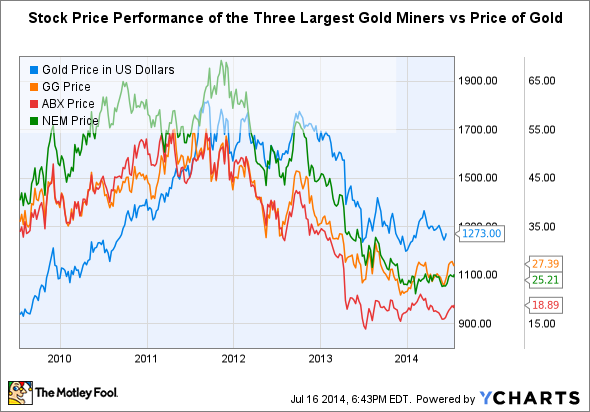 Again this is bad news for both the price of gold and gold miners. With the strong headwinds in gold, I would not advise investing in any of these stocks at the moment. The only reason to own these stocks is to "hedge" your positions in the market. The gold miners would act as insurance in the event of a sudden downturn or unforeseen catastrophe that could shake the markets. In this case, gold mining stocks would rally when other investments are faltering. However, the pain that investors may suffer in the interim waiting for the next cataclysmic event may prove to be too great, forcing many to sell these stocks at lower prices than they purchased them. If I am right, and this proves to be a false bottom in gold, then the stocks of gold miners could be headed lower then they already are. I would advise waiting on the sidelines when it comes to any gold related investment.